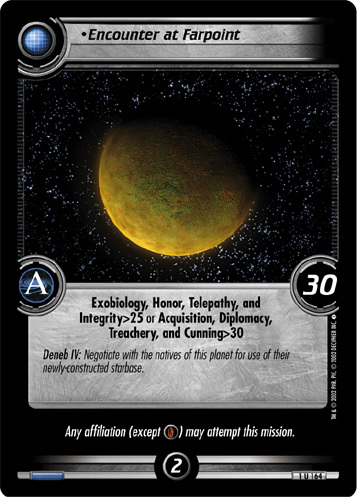 Deneb IV: Negotiate with the natives of this planet for use of their newly-constructed starbase. Affiliations: Any affiliation (except ) may attempt this mission. This card have been fully converted from 2E into 1E under OTF rules - please use Encounter at Farpoint from The Next Generation instead. "Encounter at Farpoint" is a backward compatible card form the Second Edition expansion Second Edition - ST1E compatible (Copyright 2002 by Decipher). See collectors infos for this card in the Second Edition section under the UCT-ID: ST2E 1 U 164.